Shoal Draft Fishers Island 23 "CRUSADER" history? Can anyone shed any light on the provenance and history of CRUSADER #1225? We acquired her last year and are now restoring her. I've not found much of anything at HMM or MIT. I was told by the previous owners (30 years) that she was built in 1932 but not sold by HMC until 1938. No one at the museum recalls this. I was also told by Paul Bates that CRUSADER was not competitive with the fixed keel FI23s (she was too fast) and therefore lost her potential racing market. Any information to piece together her past would be much appreciated. Re: Shoal Draft Fishers Island 23 "CRUSADER" history? John: Sorry, but I don't have any information more than what is in the registry. If you do dig anything out, please keep us posted. Claas: Do you have anything on 1225s ? Just noticed your post of the ad for Crusader. I didn't know of this material and will track down a copy of this ad. This sheds a bit of light on her history although I know she was sold to Fred Barton's boatyard in 1938...don't know where she went from there. 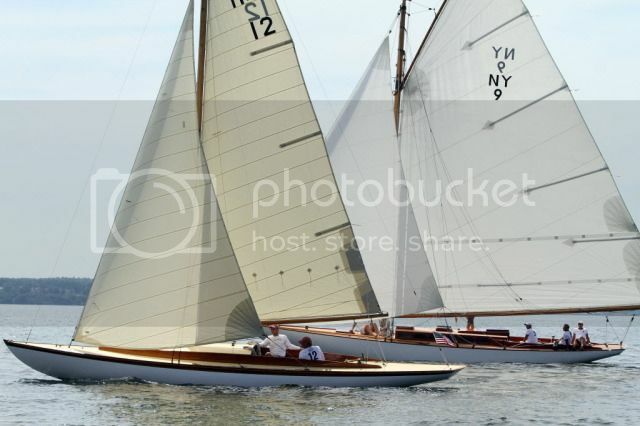 CRUSADER and AMORITA at the HMM regatta this year. Hi Everybody....I'm a Guide at the Museum, have been for eight seasons. Occasionally, we have Visitors whose relatives were former owners of Herreshoff boats. Usually, the information they have is anecdotal, with no research value. But last Fall, a couple came in, with whom I and anther Guide spent some time in the Hall of Boats. The woman was admiring our H-23 (#1505s - CONTEST). An offhand remark was made about how nice it would be to sail that boat.....to which she responded that her father used to own one of them. Grasping at straws, I asked if it had a centerboard. She said that it certainly did and that she had spent a lot of time raising and lowering it. By deduction, she was referring to CRUSADER #1225s. I did not get her name or the family's, but she did say that her brother is connected with/owns? Boston Boat Works, presently builders of MJM Yachts (powerboats). Every once in a while, we have a chance to add something pertinent to the provenance of the Herreshoff boats....but I flubbed it this time. Often, we can punctuate some of the slight information we get from Visitors, for them, by checking the Herreshoff Registry, or the MIT book, or the Herreshoff Catalogue Raisonne, while they are here. Perhaps we might develop some incentive for such folks to dig a little deeper.at home or in their memories. Who knows how many opportunities the Guides have missed. I am putting together a form to use when triggered by these occasions in the future.